← “What Is To Be Done?” In This Post? 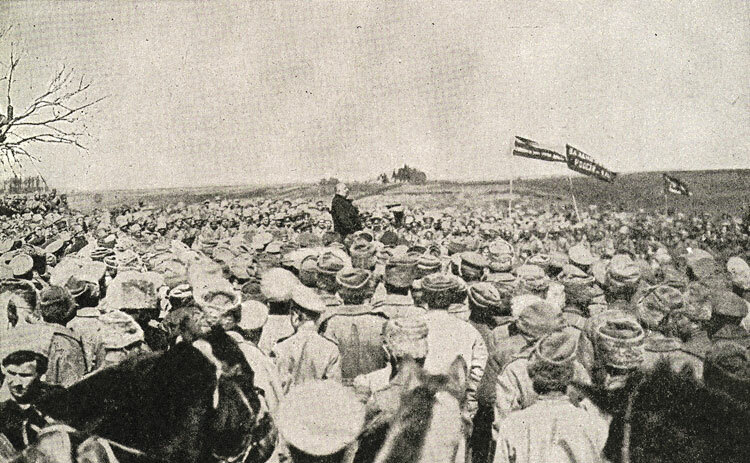 In 1917, the Imperial Russian army played a significant role in the February and October revolutions. Despite the utter defeat and loss of the Russo-Japanese War, Tsar Nicholas II decided to enter World War I. Throughout the war, the Russian war effort hit numerous obstacles as they faced hardships and loss at the front. Facing criticism for the war effort, Nicholas acted rashly by taking control of the army himself. The picture below shows Nicholas II as a Christian hero leading his army to victory, but this linked the Tsar more so than before with military defeat and suffering. Nicholas’s rash decision to take control helped lead to his downfall in March as the hardships and losses in the war was blamed on him as a failing political and military leader. Many soldiers sided with the protestors at Petrograd ordering the tsar to step down. By this time, many soldiers joined in the chaos of protest as many allied with Soviets in overthrowing the Imperial government during the February Revolution. After Petrograd, the Soviets issued Order No. 1, which was a document that altered the chain of command in the military and served as the base for the dual power between the Soviets and the Provisional Government that was soon to form. The Order gave more freedom to the soldiers. For example, the soldiers were no longer expected to observe military discipline when they were not on duty and they no longer had to address their officers as “Your Excellency” or “Your Honor.” The Order became rather controversial as it suggested that the military branch and the order of the military commission of the State Duma were subordinate to the Soviet of Workers’ and Soldiers’ Deputies. Days after the Order was passed and the Petrograd protest occurred, army leaders confessed to the tsar that they could not stop the revolution, and the tsar abdicated himself and his son from the throne in favor of his brother. The discontent and frustration in the Imperial Russian army and the promise of the Soviet Order No. 1 played a significant factor in the fall from Nicholas II from the throne. Thus rose to power the shaky Provisional Government and the Soviets as they formed a dual power for Russia. However, this solution for Russia would not satisfy the soldiers as mutinies and protests continued to occur. In a letter from General Alekseev to War Minister Guchkov in April, the document goes into detail describing the breakdown and frustration of the soldiers at the front. The soldiers are reporting to have deserted, violating military duty without caring about the enforcement of the punishments, and the officers and commanders have little to no authority or control over the soldiers. Despite the overthrow of the tsar, the conditions at the front for the soldiers did not improve and many were unhappy when the Provisional Government opted to stay in the war. The new political formation of the dual power failed to provide the political authority that the soldiers wished for so as to bring an end to their hardships in the war. 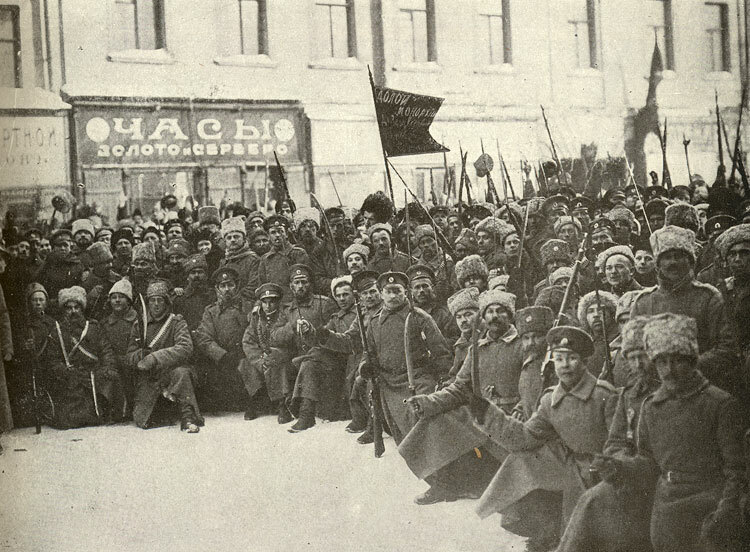 The Bolsheviks saw the continued discontent among the soldiers and protestors as a way to establish their own rule. Lenin rose with the Bolsheviks and they organized alliances with the workers’ Soviets. In the October Revolution, the Provisional Government was toppled. Once the Bolsheviks appointed themselves the leaders, they signed the Treaty of Brest-Litovsk with Germany in March 1918, much to the suffering soldiers’ relief. All in all, evidence reveals that the suffering and frustrations of the soldiers at the front during the rule of the tsar and helped the soldiers band together with the Soviets in the February Revolution. Then the soldiers’ resentment helped lead to the rise of the Bolsheviks and the fall of the dual power in the October Revolution as the soldiers sought for an end to their years of hardships at the front. “1917: Revolution in the Army.” Seventeen Moments in Soviet History. Accessed September 14, 2014. http://soviethistory.macalester.edu/index.php?page=subject&SubjectID=1917armyrevolt&Year=1917&navi=byYear. “Module 03: 1917-Did the War Cause a Revolution?” Digital History Reader. Accessed September 14, 2014. http://www.dhr.history.vt.edu/modules/eu/mod03_1917/index.html. “Russian Revolution.” Wikipedia. Accessed September 14, 2014. http://en.wikipedia.org/wiki/Russian_Revolution. Poster of Tsar Nicholas II Image retrieved from: http://www.dhr.history.vt.edu/modules/eu/mod03_1917/evidence_detail_15.html. Russian Soldiers Protesting Image retrieved from: http://www.dhr.history.vt.edu/modules/eu/mod03_1917/evidence_detail_20.html. Soldiers Hearing about Abdication Image retrieved from: http://www.dhr.history.vt.edu/modules/eu/mod03_1917/evidence_detail_26.html. Soviet Order No. 1 Image retrieved from:http://soviethistory.macalester.edu/index.php?page=subject&show=images&SubjectID=1917armyrevolt&Year=1917&navi=byYear. This post is just one of the many from the first to discuss the importance of the military, and more specifically the lower class, in the revolutionary year of 1917. Russia was only able to sustain its large army by employing a large portion of the lowest class, pulling able bodies from the important agricultural section of the economy. Overall, the poor economy, the presence of the peasants in the military, the rising influence of the Bolsheviks and the crumbling influence of the Provisional Government all led to the collapse of the Russian government that had formed after the February Revolutions. This post does a terrific job of charting out the larger context (of the military’s role in the revolution) through a coherent framing of the main events. The way you highlight the PG’s determination to stay in the war as a radicalizing factor (cf. the April Theses) is especially important. Great post. Really informative. 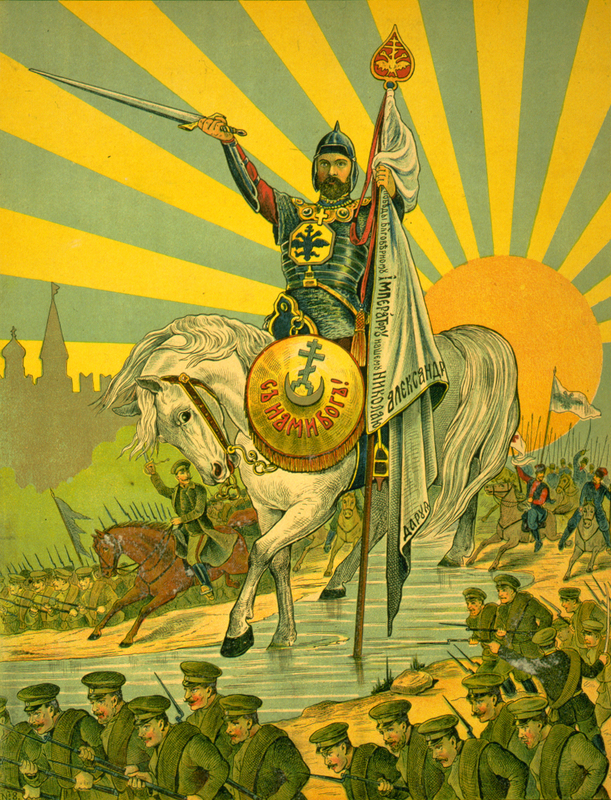 I really liked the poster of Nicholas II on the horse leading his troops in to battle. It really shows how terrible a leader he was and that it seems like he thought he was living in the times when kings would lead their troops into battle on horse back instead of the 20th century. He should have been focusing on the unrest in Russia and let his military leaders focus on raising their army’s moral.